RALEIGH, N.C. — In today’s trucking industry, data is king. That’s a theme running though the Technology & Maintenance Council Fleet Data Management and Cybersecurity Conference, held June 5-7 in Raleigh, N.C., and attended by more than 100 data technology professionals who work in maintenance and cybersecurity for fleets. The conference was held in part to build awareness of Vehicle Maintenance Reporting Standards, a licensed coding system that covers trucks, tractors, trailers and other equipment. It is used by original equipment manufacturers, suppliers and fleets to simplify maintenance through the use of alphanumeric, industry-standard codes that help describe maintenance functions. “We wanted to have a targeted, intimate setting for data professionals to meet. This is a roomful of experts and users,” TMC Executive Director Robert Braswell said. The VMRS system can be used to create a single process to document when, why and how maintenance is performed on equipment. That leads to better equipment and parts inventory control, and helps to identify where money is spent, according to TMC. “This helps to build a single language of trucking,” Braswell said. The VMRS can be a bit daunting — if nothing else because of its sheer size — said Jack Poster, VMRS services manager with TMC. At last count, it had more than 32,000 items listed in its database, including equipment, parts, repairs, issues, fixes and other information related to all the maintenance work done by technicians. That library of data is essential as costs rise for parts, especially as trucks evolve into rolling computers filled with technology that demands high-level service skills and continuous updates to ensure they run in top condition. 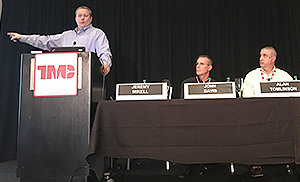 Several panels at the conference covered VMRS and discussed ways that fleets can improve their vehicle maintenance reports. John Davis, principal fleet management consultant with Dossier Systems, discussed ways to train technicians on the system. The best way to start with new people is with the basics, he said. Bottom line, data helps to explain why certain actions are taken, he said. For data to make a difference it’s important for the entire organization to understand its value, said Jeremy Mikell, FleetNet’s director of financial planning and analysis. The TMC conference was co-located with American Trucking Associations’ National Accounting & Finance Council annual conference, which offered expert insight on finance, taxation, technology, risk management and accounting. The conference — held for the first time this year — offered information technology and maintenance professionals an opportunity to build relationships and get more deeply acquainted with VMRS as it is adopted by groups such as the Auto Care Association and expands to Europe, Braswell said. 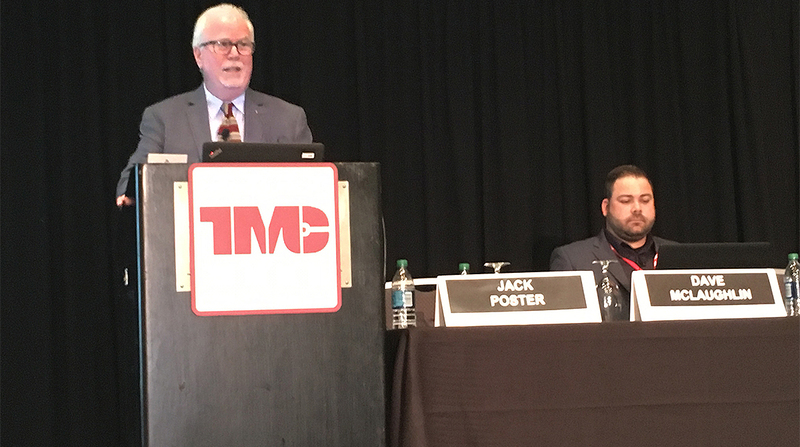 It also offered attendees an opportunity to learn about a benchmarking service launched in March by TMC and FleetNet Americas that is built around fleet-supplied data on unscheduled repairs, allowing fleets to compare their unscheduled repairs against their peers. The online TMC/FleetNet Vertical Benchmarking Program will provide detailed quarterly reports to all TMC fleet executive-level members as part of a membership. Fleets that provide data will have access to information from their peers that may assist them as they look to make their maintenance operations more efficient.